Just off Pitt Street and close to Karangahape Road, on the edge of Freeman's Bay, two domes serve as landmarks for passing traffic and pedestrians. I've often wondered about them. They feature here in a mid 1920s photo by William Archer Price (image from Wiki Commons). The three distinctive buildings are, from left: men's quarters extension to first Pitt Street fire station (1912), the Auckland Gas Company showrooms building (1923-1924), and the rest of the first Pitt Street fire station (1902). Of the three, only the 1902 building has been altered markedly. Another view can be seen at the Auckland Library's site. You can see its current appearance here. It is, apparently along with the Beresford Square building, registered by NZ Historic Places Trust as Category I. Not the Gas Company building, though. One thing I notice with the NZHPT registration entry is that they keep referring to a date as 1912 for construction, and only have an image the Beresford building, not the Pitt Street Building. I checked with Council Archives yesterday-- according to the valuation streets for Pitt Street, and apparently the fire brigade's own records, the Pitt Street building was erected 1902, at a cost of £9583 (pricey, but there would have been more than one building on the site, perhaps.) The men's quarters at Beresford Street cost £5528 in 1912. The Auckland Gas Company in 1923 were fighting to keep their market share, no longer a monopoly as an energy supplier with the introduction of electricity to the city. 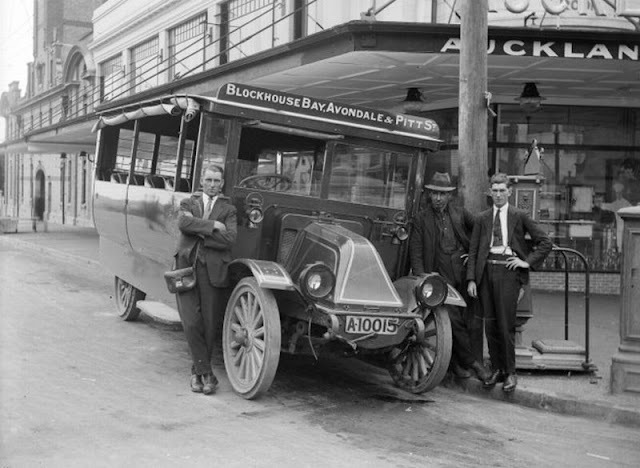 The formation of the Auckland Electric Power Board in 1922 may have been the incentive to have their showrooms here on the corner of Pitt Street and what was then Beresford Street -- close to K'Road, and major public transport routes. I'm still trying to see if I can find out the original architect for this building. So far, scans of the plans on aperture cards at Auckland Council archives show a name "John Anderson [illegible], Ferry Buildings, 24/11/1923". I'll work on it and put up an update when I have further information. According to the Karangahape Road Heritage Walks booklet (.pdf online), this was called Wembley Buildings. 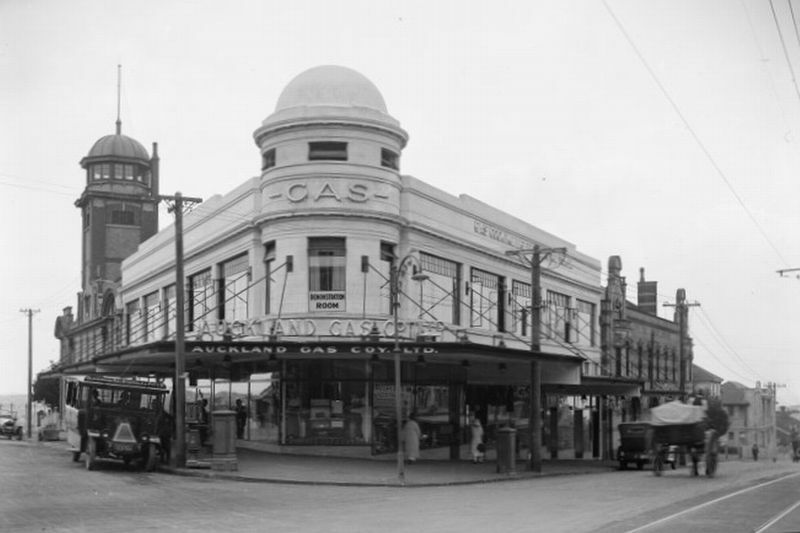 "It is said that the Auckland Gas Company refused to have electricity in this building which, if true, must have made it one of the last buildings in New Zealand ever fitted with gas lighting." Number One, Beresford Square, the 1912 extension to the Pitt Street fire station. According to this site, it was designed by architects Goldsbro' and Wade. Quite possibly (although I'd love to see the documentation): another credited to that partnership is the Marine Workshops Building in Quay Street, and the Ponsonby Fire Station. In November 1944 the total fire station site, fronting both Beresford Street and Pitt Street, was sold then gifted, via Sir Frank Mappin to the Order of St John, and became the Auckland central ambulance station. According to the late Graeme Hunt in his book First to Care, 125 Years of the Order of St John in New Zealand (2010), Mappin was a serving brother and later knight of the order. The ambulance station opened in 1945, and from 1977 was home to the National Ambulance Officers' Training School, funded by a Telethon held two years earlier. The school operated from 1978. A new ambulance station was built further down Pitt Street in 1995, and the old buildings had new uses. The Pitt Street building is now the base for a flower merchant, and the Beresford Street side professional offices. Back to the corner. This image (another by William Archer Price and likely taken at the same time as the other period shot above) shows one of the early bus services to Avondale and Blockhouse Bay in the 1920s. I'm not sure which one yet. 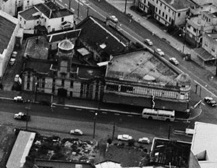 Interestingly, this corner remained as a bus stop right through to 1964, as shown by this detail below of an image from Sir George Grey Special Collections, Auckland Library (used here with kind permission). Not for much longer beyond the date of this photo, though. Today, the motorway scythes across Beresford Street, blocking the Pitt Street end from Freeman's Bay. Access today is via Pitt, Day and Hopetoun Streets. In 2002, according to the library's streets database, the eastern-most end off Pitt was remained Beresford Square (two other parts, beyond the motorway, are called Beresford Street Central and Beresford Street West. "It is said that the Auckland Gas Company refused to have electricity in this building which, if true, must have made it one of the last buildings in New Zealand ever fitted with gas lighting." That is a great anecdote to have up your sleeve. Agreed, Andrew. I'd lay odds it's a factoid Edward Bennett from the K'Road Business Association (and local historian) uses when he takes walks around that area. I would if I were him. Apparently when the Napier Gas Company insisted on gas lighting in their new headquarters in Hastings street in Napier. This was as late as 1932 during the rebuilding after the earthquake. I've been told by people from the US and Canada that quite a number of new industrial buildings there were fitted with Gas lighting even into the 1950s. Currently sitting in The Station Bar (built in the 90s according to the owner) on Beresford Square. Thanks for the historical info! Its lovely to sit with breakfast and learn a little history of the buildings around you! can anyone give me some info about the history of the station bar itself. Seeing as you're "anonymous" -- why should anyone bother?